The success of the GOP’s health care bill may hinge on abortion politics. How far will Mitch McConnell go to prove his anti-abortion credentials? 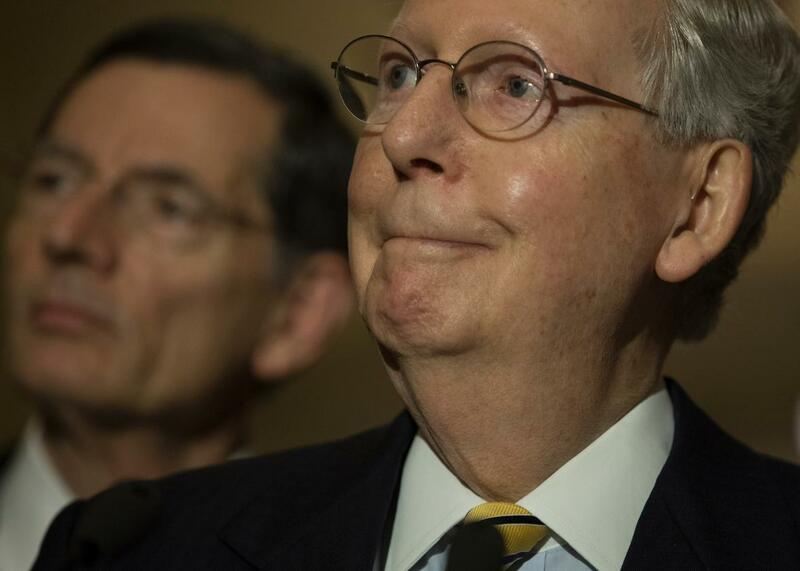 Senate Republicans are in a tough spot right now. Obamacare repeal in the form of the American Health Care Act is in their hands, and anti-abortion advocates are pushing for its success. In addition to depriving 23 million more Americans of health insurance coverage, the bill would defund Planned Parenthood for a year and effectively dismantle private insurance coverage for abortion by incentivizing insurers to drop their coverage of abortion procedures. But these very provisions, beloved as they by the anti-abortion right, may be the bill’s downfall. A rule rarely discussed outside legislative circles could keep the AHCA from coming to a vote through reconciliation, the process by which Republicans could pass the bill with just 50 votes instead of a filibuster-proof 60. The Byrd rule states that a reconciliation bill can only include provisions directly related to the budget and deficit reduction, such as changes to the tax code. It cannot make adjustments to already-authorized discretionary spending programs or include provisions meant to advance a certain policy that is “extraneous” to budgetary concerns. The anti-abortion provisions in the AHCA appear to violate the Byrd rule, potentially dooming the bill to failure. According to the Senate parliamentarian (a nonpartisan official who interprets the rules of the legislative body and advises legislators on their implementation), the part of the AHCA that would prevent Americans from using tax credits to buy private insurance plans that cover abortion care conflicts with the requirements set forth by Byrd. In other words, this AHCA provision is primarily related to abortion policy, not the budgetary concern of how much the health-care subsidies would cost. The parliamentarian hasn’t weighed in on the provision to defund Planned Parenthood yet, but by the same standards used to assess the prohibition on using tax credits for plans that cover abortion care, the Planned Parenthood provision would violate Byrd, too. The Congressional Budget Office has affirmed that this AHCA provision only affects Planned Parenthood—even though the organization isn’t named—making it a policy move rather than a budgetary one. Even an analyst from the right-wing Heritage Foundation has written that the Byrd rule would prevent the Senate from limiting the discretionary Title X funds or Medicaid reimbursements that Planned Parenthood receives, since it would be incidental to the primary purpose of the bill: making budgetary adjustments. Republicans need to pass the AHCA as a reconciliation bill if they’re going to pass it at all, because they’d never be able to get 60 votes to defund Planned Parenthood. (To be fair, getting all Senate Republicans and eight Democrats to vote to repeal the Affordable Care Act at all, even without the anti-abortion provisions, would be next to impossible, too.) So, the Hill reports, senators could try to find a way around the Byrd rule by, for example, re-routing the sources of health-care subsidies to go through federal programs that already prohibit funding for abortion care. More moderate members of the Senate GOP may also use the parliamentarian’s concern as cover to advocate against the AHCA. The easiest way around this mess would be to drop the anti-abortion provisions altogether. But legislators who depend on the support of anti-abortion advocacy groups can’t afford to anger that base. The pro-life Susan B. Anthony List has called these AHCA provisions “non-negotiable” and pointed out that a previous Senate vote against Planned Parenthood ended in a 50-50 tie, broken for the GOP by Vice President Mike Pence. In other words, advocates say, reconciliation is the only way to get this bill through. It’s up to Republicans to decide whether anti-abortion purity is worth throwing away their shot at keeping their years-long promise to get rid of the ACA.